In multisite scenarios or when you use optimization libraries you’ll need to set the TinyMCE editor css dynamically from the code. But sometimes in scenarios where you are using a optimization library like Combres to pack the CSS:s you’ll need to set the CSS programmatically. If you have a multisite scenario you’ll need different CSS for each site. Thanks to other blogposts I’ve made a variation of a descriptor that works for my solution. 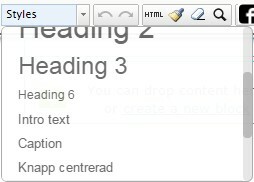 Because the WYSIWYG uses an iframe, be aware of the column widths will not work, since the editor width is smaller. Because I want to use this custom change globally i do use EditorDescriptorBehavior.PlaceLast and inherit EditorDescriptor. The result: Body tag with custom CSS and head with your context based CSS styles.